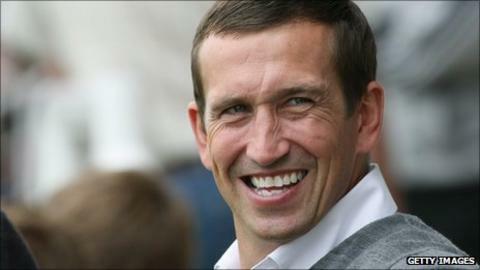 Former Tottenham Hotspur defender Justin Edinburgh has been appointed Newport County manager. Edinburgh, 41, was in charge at Rushden & Diamonds last season when the club was expelled from the Football Conference for "financial problems". He becomes Newport's sixth manager in nine years, succeeding former Spurs coach Anthony Hudson at the helm. The Blue Square Bet Premier side sacked Hudson in September after a run of 10 games without a win. Hudson, who took over from Dean Holdsworth as full-time Exiles boss in April, departed with County in the relegation zone. Edinburgh, who has managerial experience at Billericay Town, Fisher Athletic, Grays Town, has signed a contract until the end of the 2012-13 season. His first game in charge will be Saturday's home league match against Southport. Newport chairman Chris Blight said: "The board thought that it was important to act quickly after the departure of Anthony Hudson and not let things fester, we feel that Justin is the ideal candidate after looking at more than 40 other interested parties. "It's a new chapter for the club and we hope that the supporters get right behind him on Saturday and kick-start the season and look to the future together." Edinburgh, who made over 200 league appearances during 10 years with Spurs, guided Rushden & Diamonds to 13th place in the Blue Square Bet Premier table last season in his first full season as manager. But they were thrown out of the league in June after failing to given any assurances that they would be able to fulfil their fixtures in the 2011-12 season. Diamonds entered administration a month later with reported debts of £750,000.